Congratulations Arts Horizons Teaching Artist Kit Sailer on winning the NJ Governor’s Award in Arts Education! Jersey City’s Kit Sailer is many things – a carpenter, an educator, a fine artist, and most recently, a winner of the Governor’s Award in Arts Education for her work as a teaching artist. As a fine artist, the 55-year-old works in periods. She spent a decade painting, drawing and making prints of sea creatures – everything from seahorses and sea lilies to her favorite, octopuses. 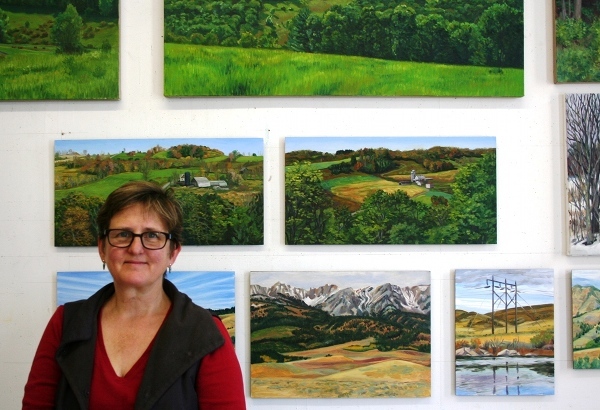 Then, after Sailer painted an oil landscape in preparation to teach a class on the medium, she got hooked and has been painting farms, fields and mountains for the past five years. Sailer’s work is a study of natural forms and rhythms. Posted on May 22, 2012, in Teaching Artists and tagged Arts Education, Govenor's Award, Kit Sailer. Bookmark the permalink. Leave a comment.